A Look Into New Jersey: Then and Now. J. McGinley-Smith//Camden – ‘The man who is tired of New Jersey is tired of life.” Well, nobody has quite made such a declaration; but given the popularity of at least one television series and of that occasionally pugnacious and bumptious Governor Chris Christie, it can no longer be shunted aside by its larger neighbors. While chary of claiming the historical heft or grandeur of Greece, Rome, or Mexico, author David Veasey’s recently released book, “New Jersey: Then and Now,” does boast of a place with a remarkably rich diversity of historic and scenic sites. If far from a bulky compendium of New Jersey history, Mr. Veasey’s neatly packaged book can be likened to a swift jaunt on a Wildwood Boardwalk Tramcar, passing leisurely by the homes of such figures as, Thomas Edison, Walt Whitman, Grover Cleveland and Woodrow Wilson. Besides contrasting earlier photographs of memorable buildings, street scenes and other landmarks, many dating back to the early nineteenth century; Mr. Veasey has written a concise and fluid historical narrative that lends the photos a necessary perspective and context. . Moreover, the slender volume – just 143 pages – not only makes a substantive argument for the preservation of places of historic significance, it even gives credence to protecting those we today may think of as quaint or quirky. Built by a Philadelphia construction firm of wood and tin sheeting, its spiral staircase arising from within the left-hind leg and its 65 foot height, make the 6-story elephant an arresting vision, by visitors up close or by passing ships. A majestic and much cherished attraction for generations of visitors to Margate, ‘Lucy’ gained national historical status in 1976. The link between improving infrastructure – whether by ferries, trains, or turnpikes – and the economic development of New Jersey’s resorts, is underscored throughout the book. The beginning of train service to Atlantic City in 1854, for instance, gave impetus to what would eventually become home to the Miss America pageant and Casino Gambling. Within a little more than a decade of access by train, June, 1870, it would be necessary to erect a loose arrangement of four-foot wide planks along the beach, providing the first rudimentary boardwalk. By the 1930’s, larger crowds required a more permanent walkway; resulting in what is essentially today’s boardwalk, a grand boulevard of concrete overlaid with pine-planks and expanding 60 feet in width and laid out in herringbone cross-patterns. The Victorian homes of Cape May -with their Gothic Revival and Italianate styles- are another example of a New Jersey shore town blossoming as a consequence of the inauguration of boat service up the Delaware River in the 1830s. Despite a destructive fire in 1878, Cape May rebuilt and earned status as a National Historic landmark in May of 1976. A safe haven for generations of fishermen, the images of New Jersey’s Lighthouses, including those at Absecon, Barnegat, Cape May and the nation’s oldest, Sandy Hook (1761), reveal stoic structures of enduring utility. 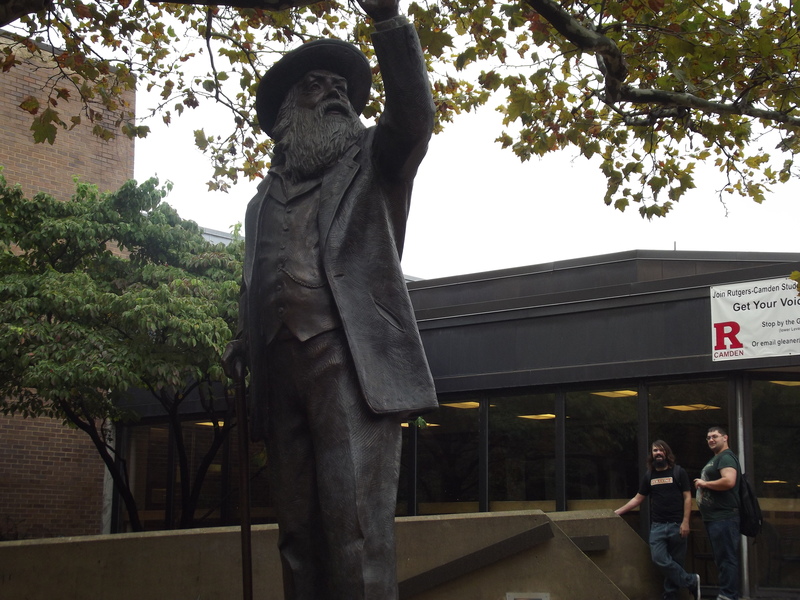 The city of Camden is recognized by the author as the last home of Poet Walt Whitman. The Whitman house, at 328 Mickle Blvd., a simple clapboard structure that was purchased for $1,750, was owned by Whitman until his death in March of 1892. Whitman’s heirs preserved the property until 1921, when the city of Camden took possession and opened a museum. By 1947 the state of New Jersey had acquired ownership of the house which Mr. Veasey notes contains many of the “original” furnishings, books and pictures. If there are any oversights in the book, it’s possibly the failure to mention one or two other sites of significance in Camden; specifically the Nipper Building, home of RCA Victor. The famous stained-glass windows in its tower have been preserved, and it has recently been renovated into luxury condominiums. The disastrous and fiery crash of the German Zeppelin, “Hindenburg” at Lakehurst, NJ, on May 6, 1937 is touched on by Mr. Veasey, who highlights the surviving original Hangar One, seen in the historical photos and films of the crash. The U.S. Navy uses it for research blimps. The urban streetscapes of Newark, Jersey city and Trenton are also part of the book’s colorful tableau, which is crowned by the startlingly picturesque scenery of the ‘Delaware Water Gap’ running along the Appalachian mountains between New Jersey and Pennsylvania. 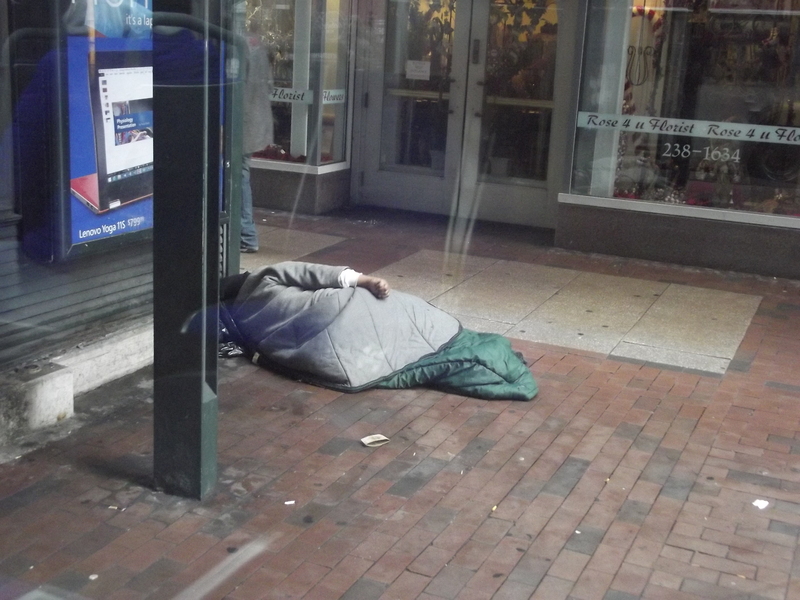 Homeless Memorial Day at Christmas. During a recital of the names of 125 individuals who have either succumbed to the severe effects of homelessness or were leaders in supporting the homeless, Luis Garcia was one of the few Latino names remembered this year..
“Once the homeless are in the streets, a person has a much greater vulnerability with their health. Those small health problems can quickly escalate into large ones,” continued Sister Scullion. Arriving in the United States in April of 1979 from a country he declined to identify, M. Santiago told El Hispano he had been homeless for thirty-four years. A part-time cleaning woman, Nancy Colon referred to similar difficulties of renting an apartment, which she attributed to discriminatory treatment due to her boyfriend’s criminal record. Since that 1991 meeting, Mr. Chapman has worked in a variety of shelters and recovery houses, instilling in others the same kind of encouragement he received from Rev. Wells. Rafael Collazo, a Representative for “Sobriety Through Outpatient, Inc.” and internet radio commentator was instrumental in organizing the Homeless Memorial Day. Philadelphia – The winds buffeting a seven ft. banner of the Virgin of Guadalupe, made especially precarious the effort of hoisting it aloft, Wednesday, as a group of fifty immigration reform advocates and Dreamer activists followed the banner of the patron saint of Mexico and Latin America, from the Cathedral of Sts. Peter and Paul to the 16th and Callowhill branch offices of Immigration and Customs Enforcement. The unwieldy banner of the Virgin of Guadalupe was perhaps a reminder of the tortuous twists of the comprehensive immigration reform debate, as well as how Farmworker leader Cesar Chavez used that same symbol of hope and patriotism. Chanting alternately in Spanish and English, “Ni Una Mas Deportaciones,” or “No more Deportations,” or “We are Here and We Are Not Going,” the group led by the Juntos organization, progressed through streets where temperatures had dropped to below freezing, until they reached the rear-garage entrance of the ICE office and placed the banner a few feet from the entrance, making vehicle exits virtually impossible. The act of civil disobedience was accompanied by a half-dozen of them kneeling on the banner and reciting the rosary, as others huddled around them. Among the group praying at the ICE garage were, Javier Garcia, a coordinator for worker health and safety with Philaposh; Amanda Armenta, an Assistant Professor of Sociology at the University of Penn; and Veronica Castillo-Perez, former Director of the prominent organization Raices Culturales; and Salvador Sarmiento of NDL. An ICE officer appeared as the group concluded the recitation of the rosary, and within an hour six more officers arrived, as the garage door opened to permit the departure of an ICE vehicle. The demonstrators, however, made it clear they were staying, and a standoff ensued that lasted several hours. “You don’t hear about it in the general media, but we hear about it from families that come to the office of Juntos to ask for help.” said Mr. Garcia. “Many of these deportations go unnoticed, but I’m told the numbers are there if you look at the statistics,” continued Mr. Garcia. “It is incorrigible to deport people who could benefit from Comprehensive immigration reform, if Congress and the President could ever get its together,” said University of Penn Asst. Professor Amada Armenta. Philadelphia – Charles Dickens once complained about the “distractingly regular” street layout of the otherwise “handsome” city of Philadelphia. “I would give the world for a crooked street,’ he said. With its many crooked pathways, the “Christmas Village” at Love Park, that has drawn thousands of shoppers into its warm confines the past two weeks, would likely have satisfied the British novelist’s imagination. “These are gorgeous,” said Daniela Sceaml, as she glanced at an arrangement of glistening wooden bowls and vases offered by Peruvian vendor Norka Inka, stationed at the 15th Street entrance of Christmas Village. It’s the type of remark Thomas Bauer has become accustomed to hearing over the last six years. 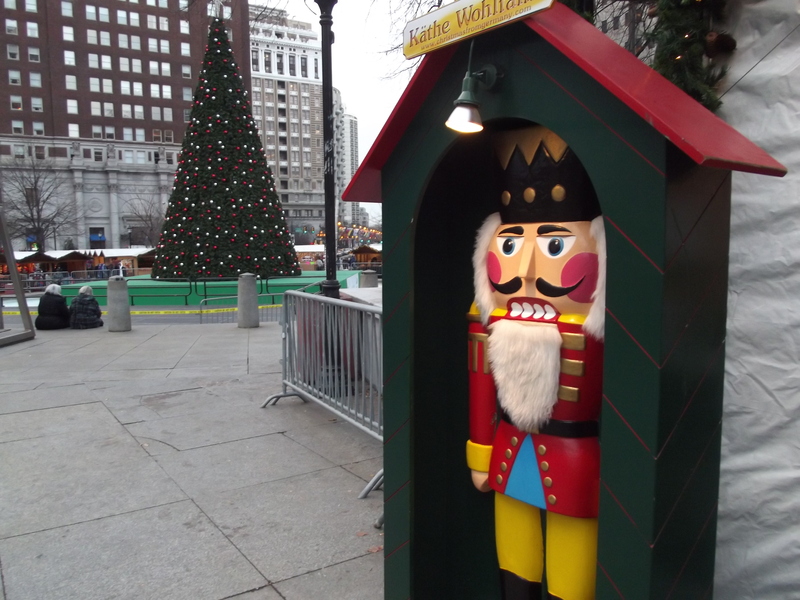 A native of Nuremberg, Germany, the birthplace the “Christmas Village,” Mr. Bauer has succeeded in transporting the concept to a city of Philadelphia that, in the early 18th century, was home to thousands German immigrants. Today, the large crowds strolling through the Christmas Village’s mazelike arrangement of booths – drawn by its eclectic collection of handcrafted goods – has made it one of the distinctive and colorful features of the city’s holiday season. Amid this international bazaar of tiny shops and booths, are representatives of some twenty-five different countries, including vendors from Peru, Mexico, Puerto Rico, Tibet, Germany, France, Egypt, Ukraine, Austria, Russia, Ireland, and Nepal. Within the circular layout of booths can be found various handmade decorative items and Christmas ornaments, Kitchen, bath and living room accessories, exquisite pottery, ornate jewelry, fresh breads, aged wines, and a wide array of handcrafted clothes – from scarves and gloves to dresses, jackets and hats. The aromas of Belgian Waffles, Latin American Churro, German Almond Strudel and Bratwurst mingles with hot cider and flavored coffees, as families pause at an elaborately festooned booth, often finding an unusual gift at reasonable prices. Whether it’s thick, handknit wool jackets made in either South America or Nepal, or hand-blown glass Christmas ornaments from Egypt, or even the handmade dolls from the Ukraine, “the craftsmanship dates back to centuries,” explained Ukrainian Lucy Stark. Vince Thompson, a media spokesman, noted that a few of the temporary shops are inhabited by vendors from Pennsylvania, New Jersey and Delaware. “So the Village also has a very local” appeal. The opening ceremony, Saturday, was followed on Wednesday, by the lighting of the Village’s Christmas Tree. Being a venerable German tradition, there is a German American weekend which will include German-American dance groups that will be performing on December 7th. In addition, there is a charity event on the weekend of December 12th, which will raise funds for the “Make-A-Wish Foundation.” And the weekend of the Army-Navy Game will include special programming and events. Beginning December 7th and every weekend after until Dec. 28th, the Village will have a specifically designed play-area for children. “So bring the kids down,” added Mr. Thompson. In the Christmas Village in Love Park, hand-decorated, glass-blown Christmas Ornaments from Egypt. leads to high cognitive and social skills. skills, 5 months behind in Math.